The Hilltop Monitor hosted the 2019 Student Senate Cabinet Debate. The event, held at 7 p.m. in room 221/222 of the Yates-Gill College Union, was relatively well-attended, with approximately 50 students spectating in-person and around 100 viewing via Facebook livestream. As of April 11, only two cabinets have submitted petitions and had them approved by the current Student Senate’s election committee. The deadline to submit a petition ends April 12. Cabinet “Will to Better the Hill” is headed by presidential candidate and junior political science, business administration and Applied Critical Thought and Inquiry (ACT-In) major Sarah Lewis, with sophomore elementary education major Carman Stephenson for vice president, first-year communication major Tavarus Pennington for treasurer and first-year chemistry major John Haug for secretary. The second cabinet, “Serve, Challenge, Belong” is headed by presidential candidate and junior psychological science major Hannah Keeney, with first-year business administration major Mario Magana Jr. for vice president, first-year political science and history major Hunter O’Connor for treasurer and junior biology and ACT-In major Micah Williams for secretary. Notably absent from the debate from the “Will to Better the Hill” cabinet was presidential candidate Sarah Lewis, who was unable attend due to changes in the schedule of William Jewell College’s softball team but viewed the debate through the livestream. All other members of each cabinet were in attendance. The two hour event commenced with a set of 13 questions prepared by The Hilltop Monitor editors-in-chief Sofia Arthurs-Schoppe and Christina Kirk. The questions covered general topics such as each cabinet’s priority list and what sets them apart from the other cabinet as well as more topical questions, like each cabinet’s position on offering free condoms in dorms on campus. This cabinet stressed their commitment to setting small goals in the hopes that they would be more achievable than the aspirations of the opposing cabinet. These small goals include the advertised endeavor of adding meal-replacement smoothies to the coffee shop menus. The competing cabinet declared much larger goals. These remarks about the priorities of each cabinet established a theme of each cabinet’s prospective approach to changemaking on campus: “Will to Better the Hill” is playing it safe by aiming small, while “Serve, Challenge, Belong” is looking to impress with lofty goals and propositions for radical change. What the cabinets did have in common was an expressed commitment to creating change on Jewell’s campus. In response to the question, “First-years, after less than one year on Jewell’s campus, what leads you to believe that you are the best choice to lead the student body?” the first-years on both cabinets expressed that they believed the opportunity of being on the Senate cabinet would empower them to become change-agents. Shortly after, the athletes were asked how they would manage the extra time commitment of being on the Senate cabinet, particularly during their season. The “Will to Better the Hill” cabinet, which is comprised of three non-athletes and one athlete, was placed in an unusual situation as their nominee president Lewis – the only athlete on the cabinet – was absent from the debate due to a softball game. Stephenson, the nominee vice president of the cabinet, stepped in and answered the question by explaining that there are various ways to demonstrate commitment to the responsibility of leading the Senate. Contrastingly, the “Serve, Challenge, Belong” cabinet is comprised of three student athletes and one non-athlete. All athletes on this cabinet were present at the debate and insisted that they were ready to fully commit to the Student Senate and would even go straight from practice to meetings, if that became necessary. The second hour of the debate was devoted to audience questions, which were asked both in person and via comments on the livestream. One question from the Facebook livestream was popular among audience members, who snapped and applauded as it was read aloud. In light of the previously referenced condom discussion, a student asked if the cabinets would work to also provide free feminine hygiene products on campus. Both cabinets responded positively, saying if they were in support of free condoms, they should be in support of free feminine hygiene products as well. The event was not without its controversy. Some audience questions led to moments of direct confrontation. One audience member announced that one of the questions posed to the cabinets was from “Will to Better the Hill” vice presidential candidate Stephenson’s mother, implying that the question had been planted as if to tip the scale in that cabinet’s favor. This was met with laughs and scoffs from other members of the audience, as can be heard in the archived livestream of the event. The question from Stephenson’s mother regarded Jewell’s marketing outreach and asked candidates for any ideas they had about recruiting new students. This is a project that Stephenson has been tangentially involved in during her time at Jewell. “I think that she brought it up because she knows… it’s important to me and something that I think should be important to this campus. So, yes, that’s my mom. I love her, she’s great – she supports me, and I appreciate that,” Stephenson said in response to the accusation. At another moment, “Will to Better the Hill” candidate for treasurer Tavarus Pennington started his response to a question posed by the moderators with a harsh generalization. “Coming to William Jewell obviously wasn’t my first option. I’m sure it wasn’t many of yours,” Pennington said. A few audience members appeared a bit put off by the assumption, and Pennington, seemingly in response to audience reaction, emphasized his passion for the Jewell community despite his initial doubts about attending the school. Another audience member took issue with the flier policy worked on by this year’s Senate cabinet, a policy which would allow students to hang posters without approval from Student Life. The audience member expressed concern about the possibility that the policy could make it easier for posters and fliers containing harmful or offensive material to be disseminated among the student body. Both cabinets defended the policy, saying offensive posters will still be reported and arguing that people who want to post offensive posters wouldn’t have gone through Student Life anyway. Back and forth between the audience member and the cabinets ensued, until the moderators intervened and Magana of the “Serve, Challenge, Belong” cabinet resolved to personally discuss the issue further with the audience member at the conclusion of the debate. Later in the evening, both cabinets were stumped by a question from a current senator, who asked about both cabinets’ opinions on the changes to the student rights and responsibilities completed by Senate in the past year. 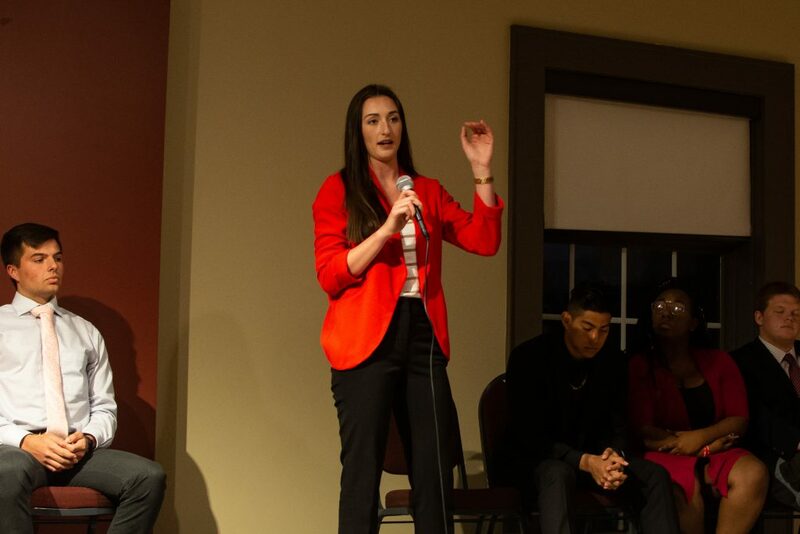 While the “Will to Better the Hill” cabinet cited the absence of their only representative who had served on Senate the past year – presidential candidate Sarah Lewis – as the reason they were uninformed about the changes, Hannah Keeney, “Serve, Challenge, Belong” presidential candidate and current treasurer of the 2018-2019 Student Senate cabinet, had a difficult time making any clear statement on the changes. The event concluded with a direct question from an audience member to the candidates on both cabinets asking about the changes they have already implemented as students. 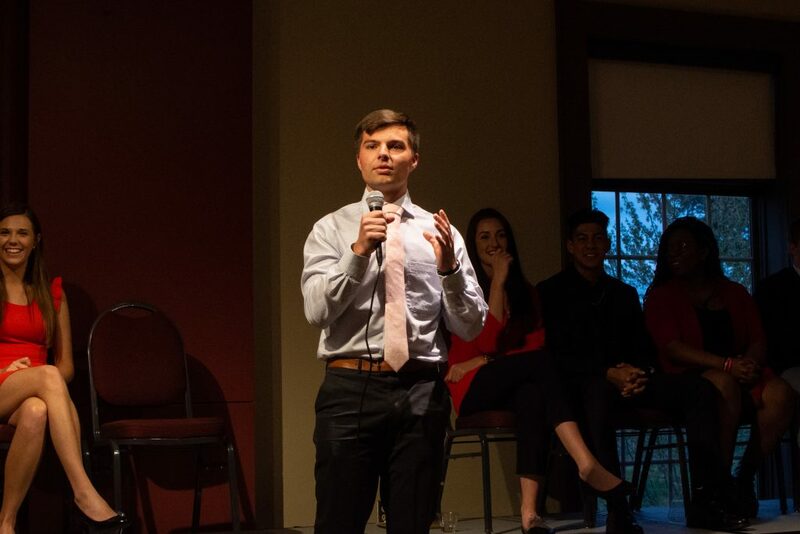 The listener seemed concerned that due to the limited time the first-year candidates have spent on campus, they do not have extensive track-records of being changemakers at Jewell. To the dismay of the audience, the first-year candidates seemed to miss the point of the question and none seized the opportunity to cite their leadership achievements to date, on campus or even prior to their enrollment. 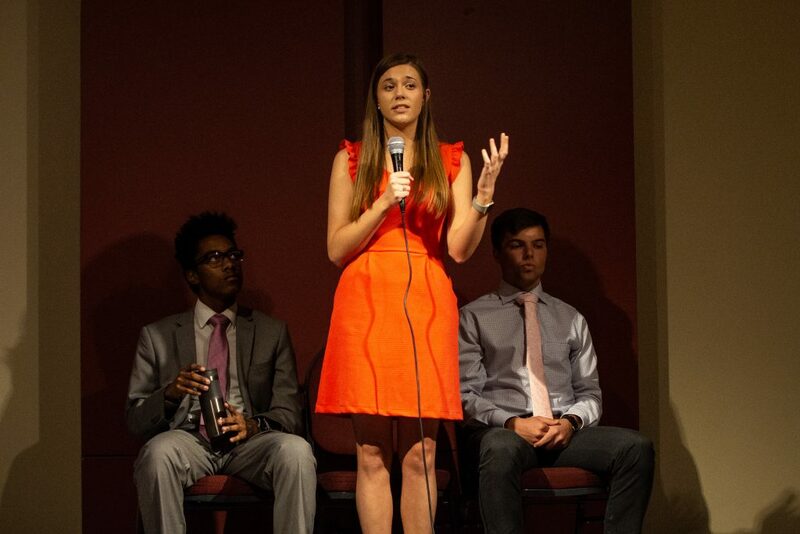 Instead, each candidate exposed the lackluster impressions they have had on Jewell to date. “In my very limited time here I haven’t been able to, uh, actually … produce tangible change,” said O’Connor from the “Serve, Challenge, Belong” cabinet. Similar statements were uttered by the members of the “Will to Better the Hill” cabinet. “We obviously haven’t been here that long, we don’t have that much ability… we haven’t had much time to build up the reputations that we could actually effect change that would be applicable on a widespread level,” said Pennington. Those statements were the concluding remarks of the debate and, while they may have been honest and well-intentioned, they left a bad taste in the mouths of voters who are looking for great things in their Senate. Despite a few dissatisfactory comments from the members of both cabinets, each candidate spoke passionately about bringing lasting change to Jewell and presented themselves as committed students ready and willing to lead. Voting will begin Monday, April 15 during Jewell Time and conclude Thursday, April 18 at midnight. The elected 2019-2020 Student Senate executive cabinet will be announced Friday, April 19 during Jewell Time.